Yeah, it's Ron again, talking about some Kickstarter game. Probably some kind of 2D platformer inspired by the popular "old man" games from his past. What else is new? True. True. Kickstarter tends to come in waves. At times I can go months without looking at the site or kicking up anything that interests me. Others times, I feel a full on assault of quality games right after another, so many of which I can't say "no" to. 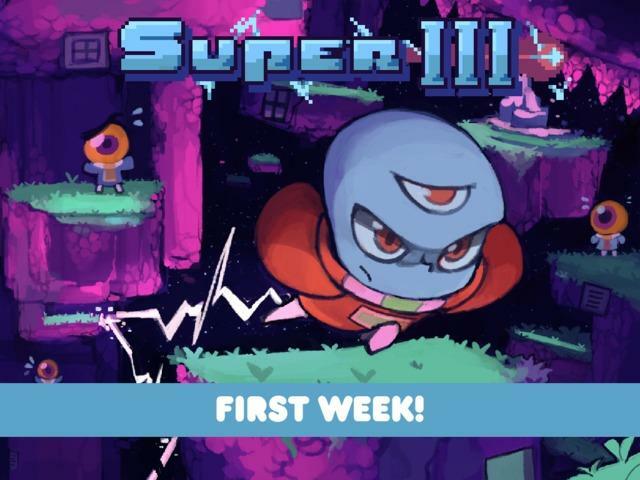 Following the success of Aegis Defenders, and the continuing high profile campaigns for Hive Jump and Adventures of Pip, there is one more little platformer that has caught on with the gaming circles called Super III. Super III stars an adorable blue alien who uses his powers of teleportation to rebuild his spaceship and rescue his crew members. Inspired by the likes of Super Mario 64 and Super Meat Boy, the game is a challenging platformer with a gauntlet of tough obstacles, simple mechanics, time limits, and multiple goals hidden within each level. It's the kind of simple indie platformer built around pure level design, and the possibilities are endless. Did I mention the hero was really cute? Just look at that little guy. Unlike most Kickstarter teams, the indie developers at Super 91 don't have a history of AAA background. They are fresh to the industry, and what they have shown so far proves promising enough to inspire confidence. The art and music are there, the gameplay is solid, and the designers really know how to shake up the formula to make some great challenges and boss fights. It's not going to change your life or anything, but Super III is definitely a game that deserves to exist, and you can help make it happen. Despite getting relatively widespread coverage from most major gaming publications, the team is struggling to get the numbers up. Perhaps it's the lack of experience or relatively steep $39,000 for a game of its simplicity, but Super 91 has only pulled in $9,000 in Super III's first week, a rate which isn't going to cut it. Give it a chance, and you might find something you like here.